Automatic vans are now a reality. Technical advances mean that vans can now have automated gearboxes and these are becoming increasingly widespread. Most commercial vans previously have always been made with manual gearboxes only, making automatic van hire not widely available in the UK. This often causes problems for drivers who are only able (or willing) to drive automatic vehicles - whether due to licence entitlement, health and mobility restrictions or personal preference. Most van rental companies still buy vans with manual gearboxes only. This is down to cost - pure and simple. At this time, automatic transmission in vans is still a costly additional option. However, this situation looks likely to improve, as the new breed of automated gearboxes is proving to be popular and effective. We don't currently have any van hire companies offering automatic van hire. Do you offer automatic vans to rent? WANT TO SEE YOUR COMPANY LISTED HERE? 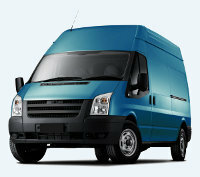 We're seeing increased demand for Automatic van hire. LIST your company here for ONLY £50 a year. When you think of automatics, you probably think of conventional torque converter-type car automatic gearboxes. The automatic transmissions now fitted to vans are completely different. Although modern automatic vans still offer the key benefit of not needing to operate a clutch or change gear manually, they are actually manual gearboxes in disguise. All you have to do is put the gear stick into the 'Drive' position and press down on the accelerator. If you are hiring an automatic van for the first time, do not worry if you are not sure how to operate the system - they are very simple and the hire company will show you how the particular system fitted to your van works. Automated Manual Transmission (AMT) is the technically correct name for this modern breed of automatic gearboxes. The vehicle still has a normal manual gearbox and clutch - but they are automatically operated and hidden from the driver. These modern automatic gearshift systems have several advantages over old-style car automatics. The two biggest advantages are greater fuel efficiency and better performance. They are also better able to cope with heavy weights (as in vans) than old-style auto boxes. The superiority of this type of automatic transmission is illustrated by the fact they are becoming increasingly popular in cars - replacing the now old-fashioned traditional automatics.